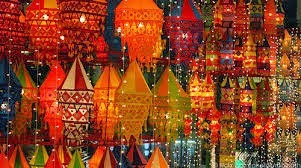 yes,you are right I am talking about those gorgeous coloured fabric patch work motifs.Applique of Pipli derives its name from a small village of the same name situated near the beach city of PURI, Orrisa.Almost every house in this city is engaged in this vibrant colour business,in local called CHANDUA. It is interesting to know that this village was established by the king of orissa to accomodate the skilled craftsmen who design appliqué umbrellas and canopies for the annual Jagannath Yatra.So as many handicrafts of India this applique work also originated as temple art and reached its peak in 11th century under the nobility of the King. 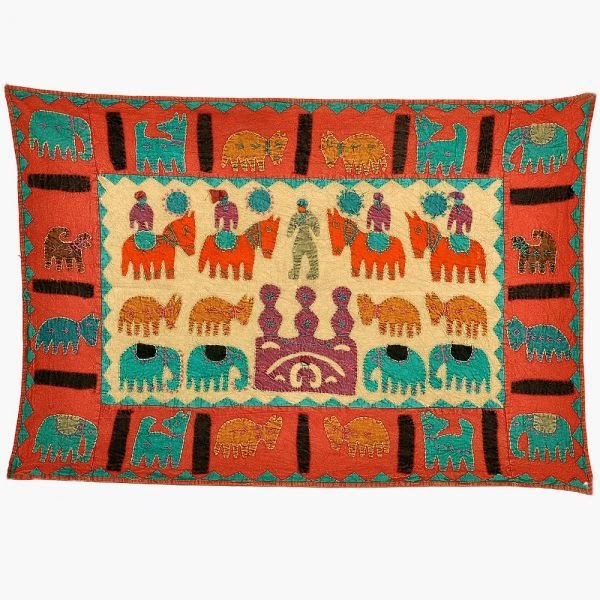 But soon this enchanting form of fabric based patchwork, well known for its geometric motifs and stylized birds, animals and flowers cut out of brightly coloured cloth and sewn on contrasting backgrounds found its way in a wide range of household,decorative and ceremonial products. 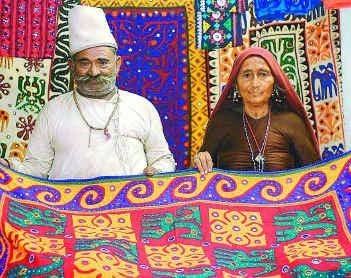 The craft is traditionally practiced by a community of professional tailors, known as ‘Darjis’. Their beautiful work is considered a service for the Lord, or “seva”. The community, led by a chief, is well organized, with annual meetings to resolve any social or other problemsThe basic design of all three is similar, being a combination of narrow and wide stripes while on the four sides above the openings, there are appliquéd mythical motifs like Rahu, Chandra as well as motifs from nature. It is these eye catching appliqué covers which help identify the chariots of the three deities from far away when thousands of pilgrims throng the main road of Puri on which the gods make their annual sojourn in the chariot festival. Appliqué work is also used in making seats and pillows for the deities and also for their ritual dresses. The choice of applique items of Pipli origin for a prospective buyer does not end here. Manufacturers in Pipli and Puri are nowadays flooded with offers from star-rated hotels and resorts to supply applique made side walls and garden umbrellas. Upcoming designers are also considering it a new way to express their creative visions. Accordingly, the fabric used for this typical patchwork has undergone a refreshing change. It is no more the same thick cotton base that is used to elaborate a certain theme; now experimentation is done with fabrics as varied as velvet, satin and Georgette. A growing demand for Pipli art, especially by foreign tourists has resurrected this previously neglected cottage industry. Machine stitching has also caught up with the artisans of this town which is a proud achievement for these workers. But the people of this town are mostly proud of their handcrafted achievements because that is the purest way of keeping their art heritage alive. The neighbor state of Orissa..Bihar..we can find the'kahatwa' the applique work of bihar used to craft decorative tents,canopies,shamianas etc.In those lovely vibrant colours they design persian type trees,flowers,animals,birds,local stories,For conopies the whole design with circular central motif is cut out of a single cloth. A thick fabric and Geometric patterns are used while making the Tents on important occasion or functions. The cutting and designing are done by the men while the women do the stitching work Apart from tents, Kathwa is also used in decorating women's garments. In this case the applique work done is more artistic. This work is so fine that in past it was used by kings,emperor and the nobility. Actually you do not need to ask 'is this from rajasthan?' because these craft pieces will be labelled with the magic of Rajasthani beauty. Beautiful colours as Red,Orange, Pink,Yellow and as bright as you can imagine are available here.The base is prepared first in the square shape, rectangular and circle shape or even in oval forms sometimes. This works as the background for that art piece. The `Applique` motifs of contrasting colours are then cut into various shapes like that of animals, birds, flowers, leaves celestial bodies and geometric shapes. These variously shaped motifs are now stiched oh the base of these fabrics in artistic way. 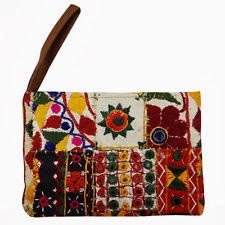 In Rajasthan, `Applique` is sometimes done with embroidery to give a magical style of decoration. This is done on almost all things such as clothes, bed sheets, lampshades and wall hangings. 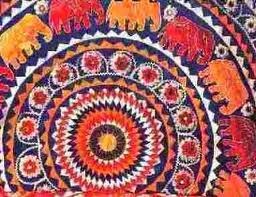 The two the notable `Applique` works of Rajasthan are `Gota` and `Kinari work`. These `Gota` and `Kinari` are golden and silver coloured pieces and laces those are sewn on the cloth. The Muslim craftsman generally prepares these. Here in `gota` work, the embroidery is made on a velvet cloth, which gives it a unique look. 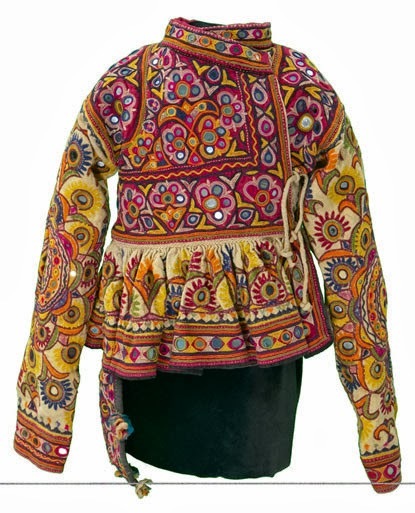 The `gota` work uses the `Applique` works in both the classical and folk designs. The `gota` work is mainly done on the costumes for women. Khandela in Shekhawati mainly prepares these items. Lets ask any thing and you will get it here as quilts,bags,jhoomar,jhalar,doorhangings anything.Infact quilt made in Jaislamer in local known as RALLI. 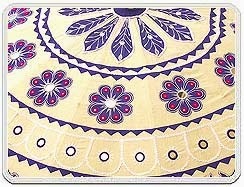 The bed work known as MOTI BAHAR is also an speciality of rajasthan. Giving several folds makes raised motifs of the `Applique`. The intricate stitches such as bakhia, guntha, turpa, chikan and other embroidery techniques are the main elegant part of the `Applique` artwork. Recently, the use of small and bright mirror pieces has become popular in Rajasthan. The last work of the `Applique` is the stitching of the borders. In Gujrat applique work is used in decorative ideas of celebrations as well as animal trapping.The applique is carried out on red cotton cloth against a white background.In the19th century, the Kathis, an agro-pastoral community of the Kathiawar region of Gujarat and their Muslim associates, the Molesalaams, or the landowning community are known to have produced intricate appliqué work. 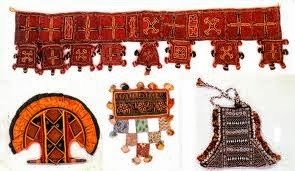 Some of the surviving specimens show a wide representation of stylised human and animal figures in cotton and silk cloths, bandhani (tie and dye), or patola cloth.